Well, if you’re into checking Map Quest the distance from Anchorage to Cantwell is listed as 210 miles taking about 3 and a half hours. As visibility decreased coming out of Anchorage and snow flurries blew across the road, we knew the miles would seem longer and the time would be more than predicted. After the first hundred miles the road was snow covered with two tire tracks leading north and two tire tracks heading south. Meet a semi and there was a short-lived ground blizzard to be dealt with. Long and short, the trip we (myself and photographer Mike Kenney) expected to be chocked full of gorgeous scenery was still pretty but less than the scenic we expected. The trip back to Anchorage will be better as Sunday March 1st has dawned crisp and clear. We were rewarded with “scenic” last night. 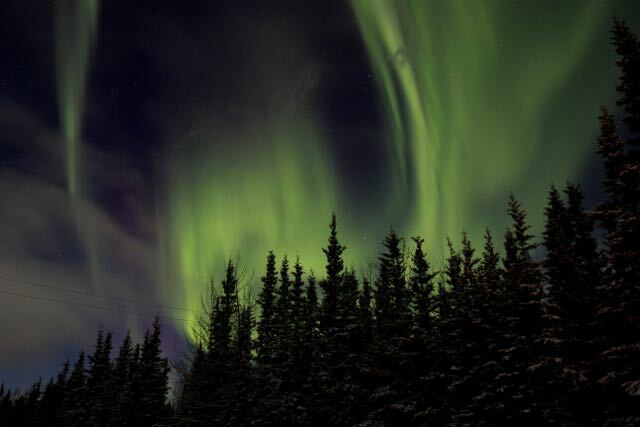 The cloud cover dissipated leaving the sky filled with stars, moon and northern lights. This all happened as we headed toward the Cantwell Lodge for a burger. Never mind eating, we need to shoot the lights. It was a nice display that was all too soon clouded over. Breakfast for mushers, families and volunteers was served at the Cantwell School. It was a hearty meal of scrambled eggs, sausage and pancakes. At the breakfast, Dr. Jayne Hempstead, DVM received Bib #1 as the honorary musher. Dr. Jayne has volunteered her services as a veterinarian for the race for twenty plus years. She enjoys working with the kids and loves teaching them about the finer points of dog care. Thanks Dr. Jayne for your dedicated service to the Junior Iditarod. The start is schedule for noon at miles marked 132 on the Denali Highway. The juniors will run 65 miles east for their mandatory rest and differential adjustment at Alpine Creek Lodge. You can follow the progress of the race and read biographies of the mushers at jriditarod.com.